This pair is my second pair for the Sock CAL. You can read about the first pair and about the sockalong from my previous post. I had chosen this pattern in the beginning of the sockalong. The pattern, Baseline Socks is by Deanne Ramsey from Addydae Designs. The pattern is amazing, I just love it!! The yarn is from John Arbon Textiles, Knit by Numbers 4ply. I don´t think I can find words to describe this yarn. It´s something that I have never before crocheted with. It´s super soft and beautiful. 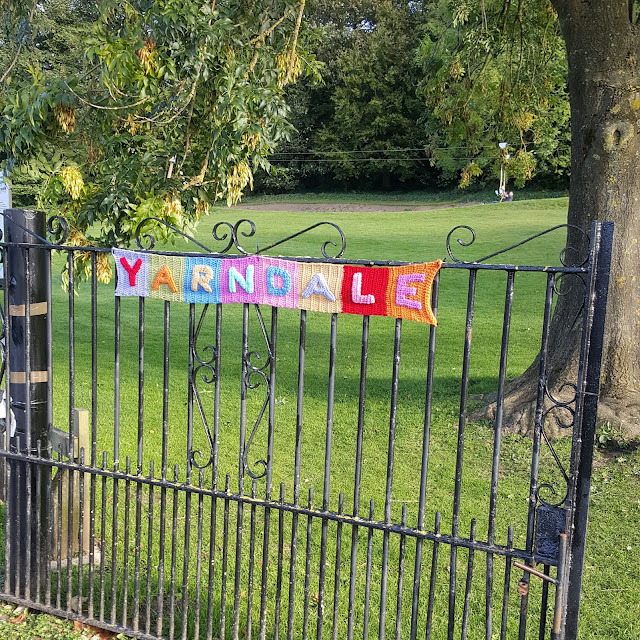 I bought it from Yarndale. Now I wish that I had bought more. I started to crochet with a 2.5 mm hook all the way to the heel. Then I changed to 3.5 mm. Also few rows of the leg part is made with 3.5 mm. Then I changed to back 2.5 mm. The pattern stated that the leg part should be 10 cm long. I made it shorter. Only 5,5 cm. For the cuff I again changed the hook to 3.5 mm and made three rows. At September I discovered from IG that October is a sock month, socktober called. I have crocheted one pair before, almost two years ago. I enjoyed crocheting that pair, it was easy and fast to do. So I jumped right away to this sock crochet along. 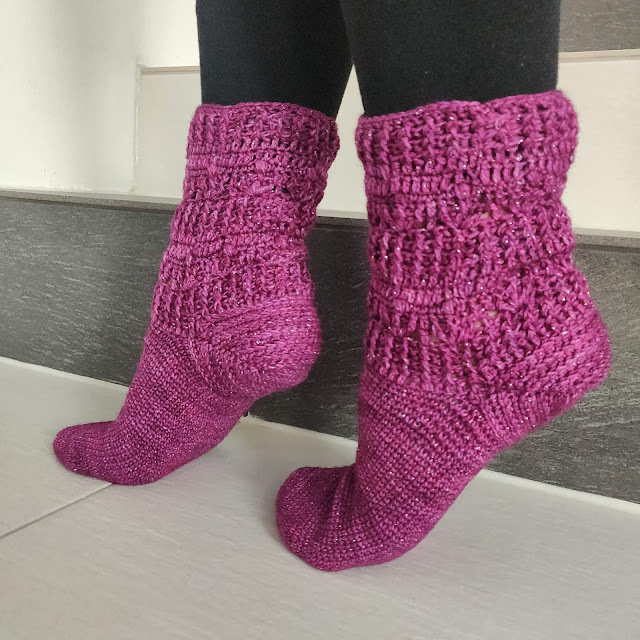 Very good articles about crochet socks can be found from various bloggers. 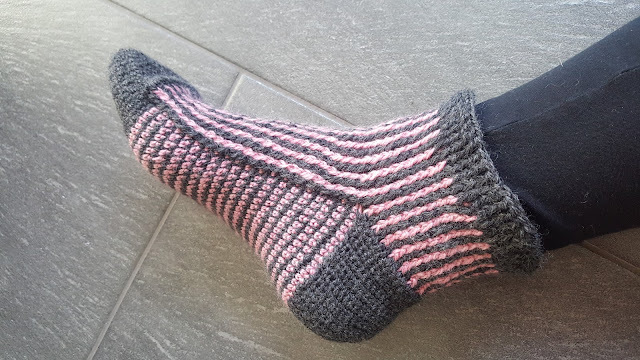 Tamara from Crafty Escapism has organised a blog hop for this sockCAL. I have had good tips for my crochet socks journey. I chose Pearl Socks by Mon Petit Violon to be my first socks of this CAL. I had the yarn ready, Lanitium ex Machina, glitter sock yarn. I had bought that yarn from knitting festival in summer 2017. I just realized that this is my first crochet hat, for me. Well it was about time! This is Skipton hat. It is designed by Vicki Brown. She designed the hat last year while traveling to Yarndale by train. I bought the yarn two weeks ago from Yarndale, from Vicki Brown herself. The yarn is dk weight (75% superwash merino, 25% nylon) and it has 225 m per 100 g. I used hooks that was mentioned in the pattern, 3.5 mm for the headband and 5 mm for the rest of the hat. This was super easy to make, and fast too. The yarn is ah, so soft! If you are looking for a slouchy hat pattern, this is it!